There are few things in life more exciting than welcoming a new baby into the family. This is one of the happiest times in a couple’s life, but it can also be one of the most expensive. There are a lot of things that new babies need, and they are not always inexpensive. For instance, you need to have special furniture just for babies. Many people feel that since they are not going to be using this furniture for very long that they don’t need to bother wasting a lot of money on it. They end up getting cheaply made items from department stores that don’t last until the baby has outgrown them. Buying baby furniture in Columbus, Ohio is easy, and you don’t have to bother with department stores. All you have to do is take a short drive to Amish Originals Furniture Co. in Westerville to find the highest quality baby furniture in the area. Yes, it is a bit more expensive than the furniture you will find in department stores, but it is much more beautiful, and it is built to last. You never know how many more babies you may have in the future, and there is no sense in having to buy furniture each time you have a new baby. The baby furniture you buy at Amish Originals is built to last for generations, so all of your children will be able to use it, as well as future generations of your family. These items include bassinets, changing tables, etc. This is going to save you a lot of money in the long run. Another way to save money at Amish Originals is to buy furniture that is going to grow with your children. For instance, your babies don’t really need to use dressers until they are walking. Smaller dressers are ideal for children, and they are often used by teens and adults. Storage items are also important, such as shelving and chests, which are both available in many different styles. You will also need to think about beds. Obviously, your baby is going to need a crib for the first couple of years. But, instead of spending money on a crib and then a toddler’s bed later on, you can get a convertible crib. This can go from a crib to a day bed to a toddler’s bed, just by removing a few rails. These are available in youth and full size beds. Buying furniture in Columbus, Ohio is easy when you shop at Amish Originals Furniture Co. Each piece of furniture on the showroom floor is hand-crafted by members of more than 70 Amish families from the area. 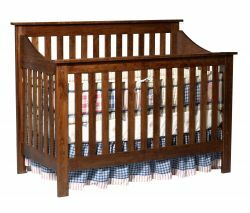 You know the reputation of the Amish, so you know that you are only going to get the best quality baby furniture and more when you shop here. Make sure you check out all of the other items available to decorate the room to get it ready for your new baby.